The year is already more than half over, and we have read so many great books already. It's time to share a few. 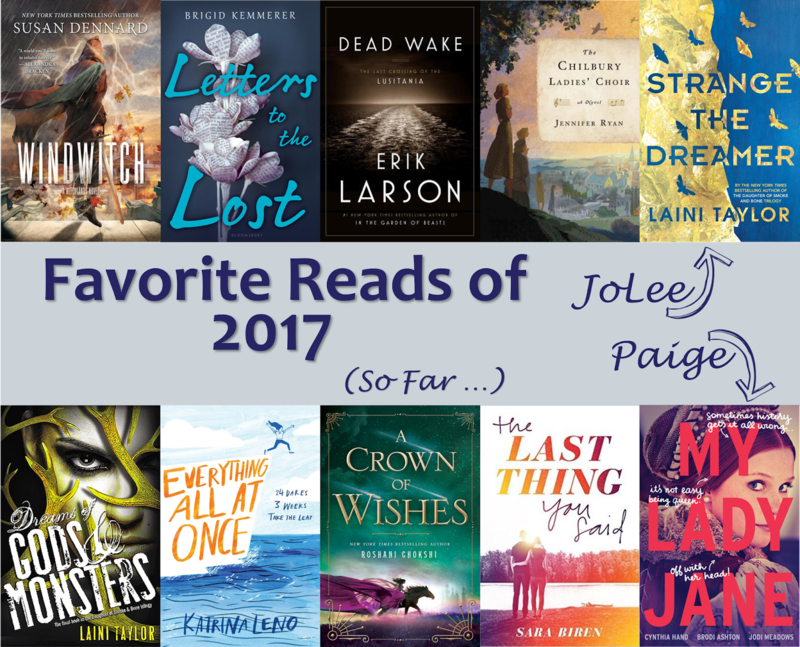 We didn't want to spill the beans too much on our Favorite End of the Year Reads, so Paige and I each picked five of our favorites. And let me tell you, sticking to just five was not easy. The series follow-up to Truthwitch is pretty spectacular. I liked this book so much because it just went in so many unexpected places. The characters and the world felt like they expanded tenfold in this addition to the series. I really, really hope that the series can maintain this quality. My favorite book club pick of the year so far.I love the way that Larson weaves together the stories of the passengers of the Lusitania, the men on Unterseeboot-20, and Woodrow Wilson's presidency in the days leading up to the ship's sinking. I've been recommending this book to everyone who loved The Guernsey Literary and Potato Peel Pie Society. Set in England during the early years of World War II, The Chilbury Ladies' Choir is a epistolary novel told through letters and journal entries with a decidedly female perspective. I've been looking forward to this book for a long time, but it had been long enough since I'd read the first two books in the series that I couldn't jump right in. I reread those and then devoured the conclusion. Ending a series is incredibly difficult, but this was beautifully written, the kind of story you fall into and can't get out. After reading, and loving, Katrina Leno's The Lost and Found, I was excited for this one. It did not disappoint. Ms. Leno writes beautiful magical realism. This book is infused with a feeling of possibilities and "what ifs." It was an achingly lovely read.